We all know this moment. We all love this moment. But few have seen it portrayed as beautifully as this. In yet another time-lapse video, YouTuber artist, Adam Scythe shows off his skills in the watercolor medium, this time tackling one of the most memorable scenes of the entire Zelda series – and he absolutely nails it. Running at about three and a half minutes, Scythe gives a look into his processes, beginning with the basic sketch and ending with a scene with the perfectly mysterious atmosphere. From the somewhat creepy visage of the old man with the sword, to the astonished young hero just beginning his adventure, to the lovely shading effects drawn in alongside the torches, the entire picture slowly comes to life before your eyes, supported by a wonderfully appropriate song (“Our Story Begins” by Kevin MacLeod). This process is truly a sight to behold – but don’t take my word for it. 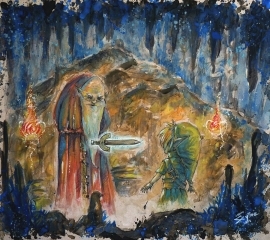 I implore you watch the video above and check out some of his other Zelda watercolors. While we get to feature plenty of great fanart, we rarely get to see the process behind it. What do you think of this painting, the process, and/or the artist?